Going to Siena is as near to an out-of-body experience that a Florentine can achieve - at least within the range of an easy hour's drive. Florence and Siena are two strangely parallel universes. In fact, they have almost everything in common (socially, culturally and linguistically) - but their respective inhabitants would deny that to the last breath...even under torture. 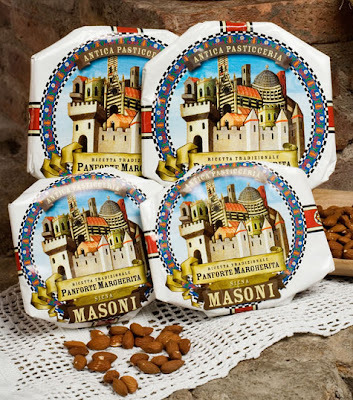 In the interval, no one could deny that the Sienese learned to do two things supremely well: (1) make traditional sweets, and (2) bear a grudge. 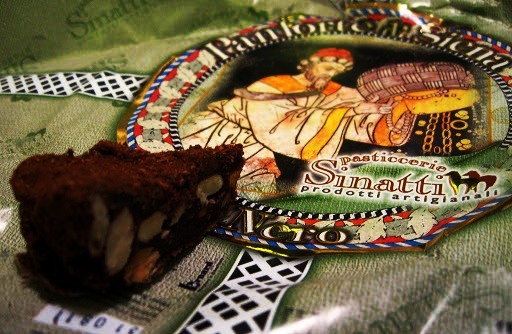 "There is nothing wrong with Siena," Florentines are quick to admit, "if you don't mind living in a panforte package." 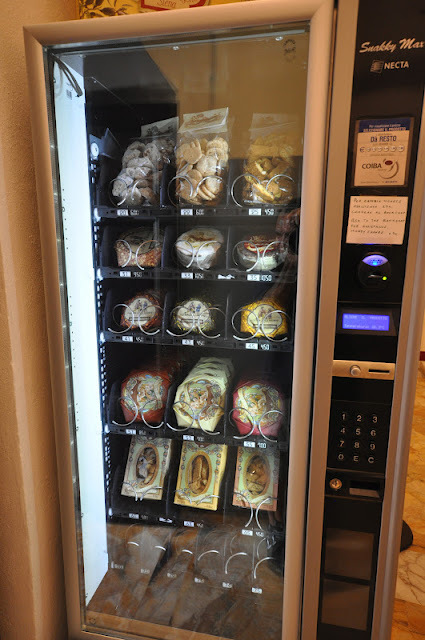 That is another way of saying that the clock ran out in 1555 and the Sienese have been burrowing deeper and deeper ever since. Under thick layers of historical quaintness. Not to mention honey, nuts, candied fruit and powdered sugar. 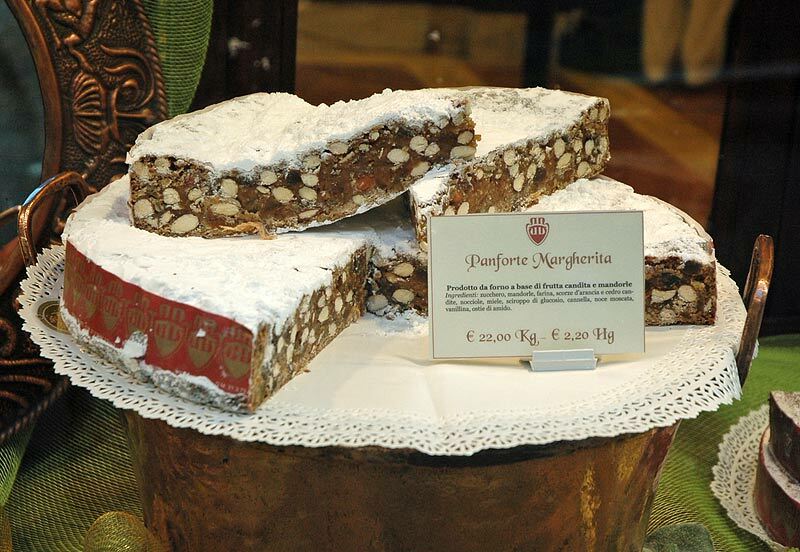 The most distinctive Sienese delicacy is panforte or "strong bread" - which doesn't even begin to describe it. 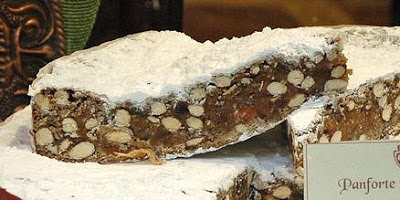 A gloriously improbable amalgam of fruitcake and chewing gum, which sums up the manic excess of the place in a single bite. 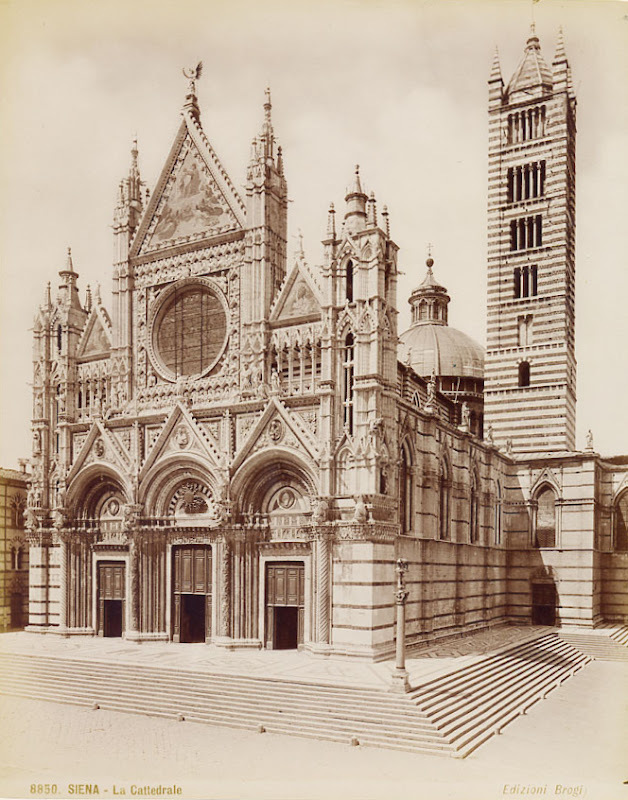 Siena Cathedral in a Brogi photo from the late nineteenth century. When it comes to "over the top"﻿, Siena's Santa Maria Assunta exists in a stratosphere of its own - even amidst the unrelenting splendors of Italian cathedraldom. More than once, it has been called "Architectural Panforte"... and who can argue? Reality Check: the upper facade of Siena Cathedral from the back. 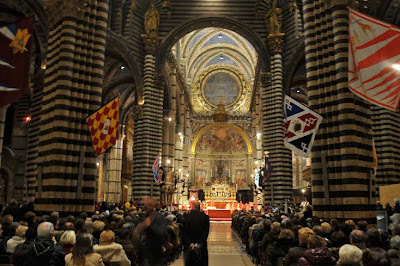 But like most proud expressions of Sienese Culture, her cathedral bears a tendentious relationship to what passes for reality in other places we know (Florence, for example). We need only turn the corner to find ourselves offstage, with the ingenious machinery in full view. 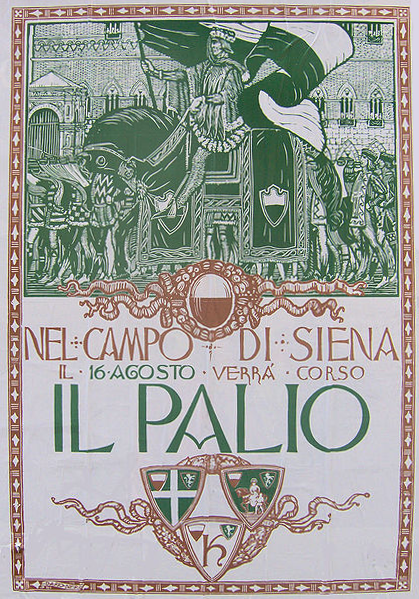 The Palio of Siena: the official poster. 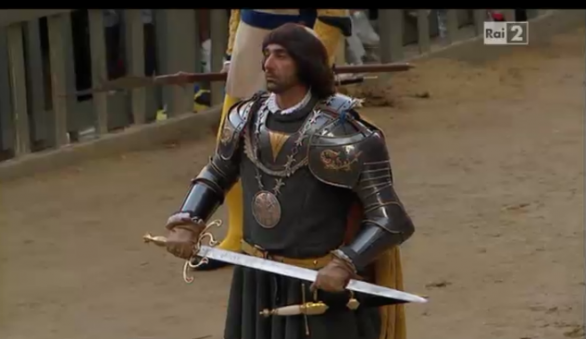 Taking the curve in 2011. 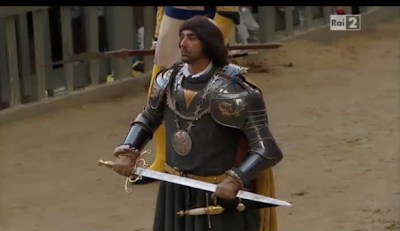 The Palio 2012, from a RAI newscast. 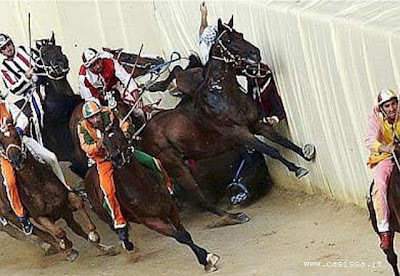 But the most overwhelming spectacle of all passes largely unnoticed. It takes place immediately after the second Palio, in the relative lull before the Christmas season - while the Sienese are recovering from their wounds and nursing their celebratory hangovers. 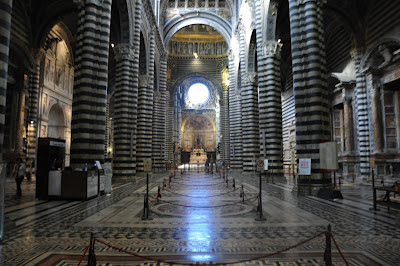 The Interior of Siena Cathedral. 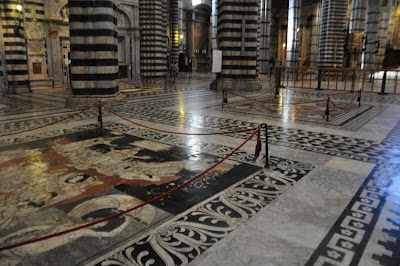 The figured pavement of Siena Cathedral has been lauded for centuries as "the world's most beautiful floor" - and frankly, it is difficult to imagine even a close second. But for ten months of the year, it is covered with duck boards and matting, not to mention worshippers on folding chairs. 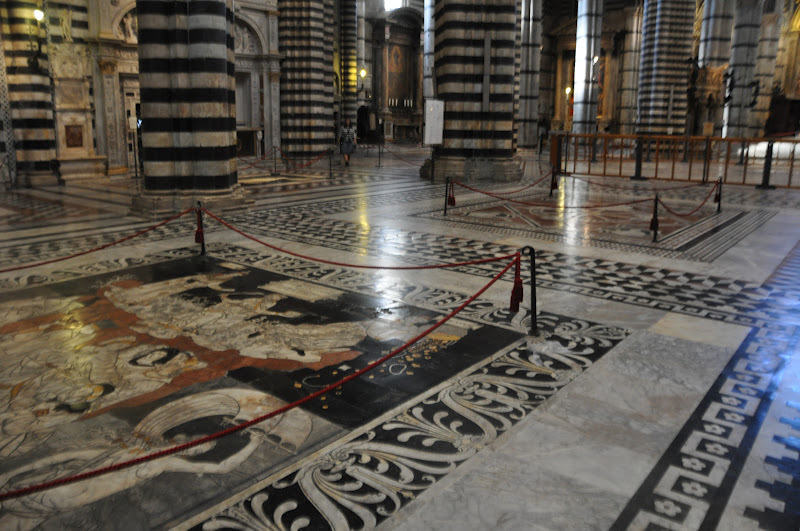 Siena Cathedral: Sensory overload in 360°. 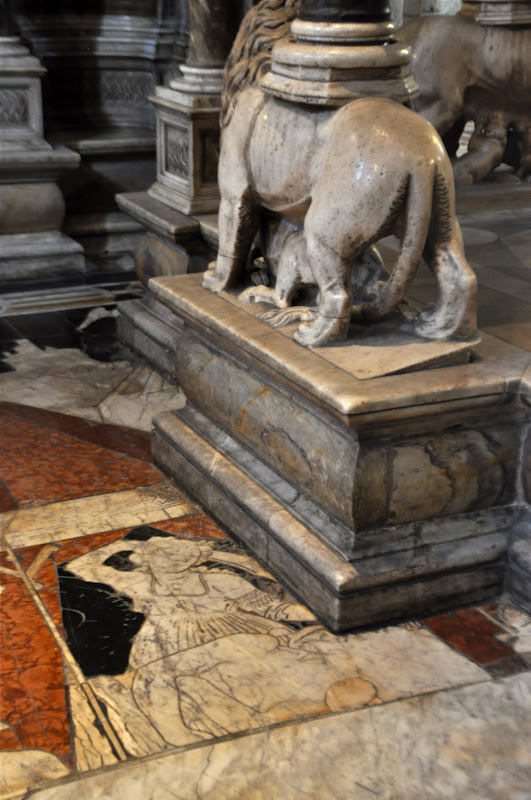 The initial effect is like wading into an outsized panforte - but that is only the beginning.The pavement was realized in colored marble in many phases over five hundred years (from the 14th through the 18th centuries) creating a vortex of allegorical configurations, historical analogies and generally horrifying biblical scenes. 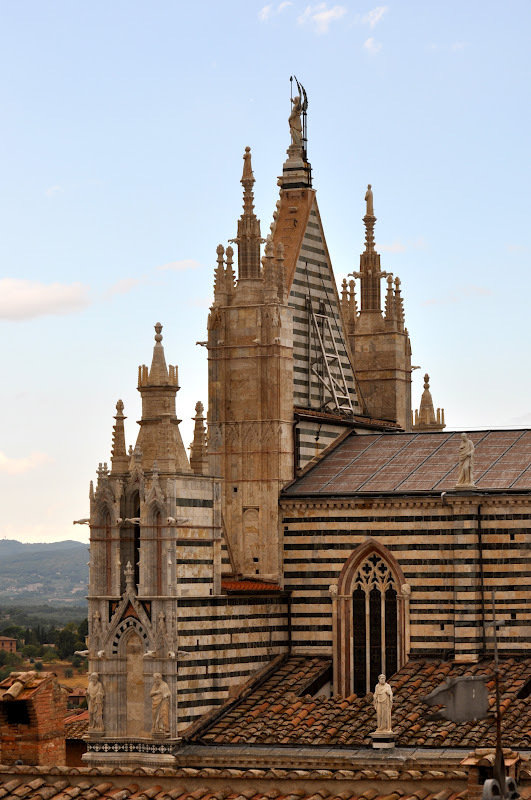 supporting Nicola Pisano's mid-13th century pulpit. of eluding a disastrous prophecy. 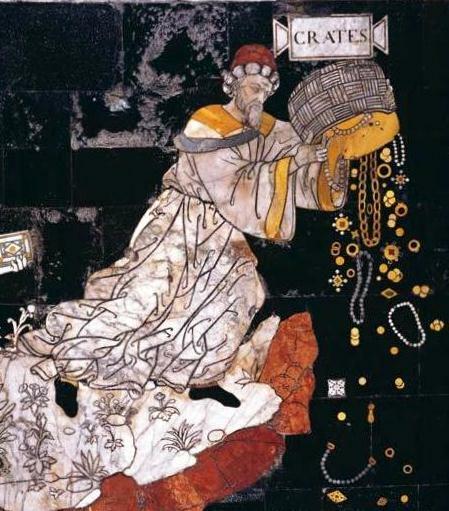 Crates in inlaid colored marble. 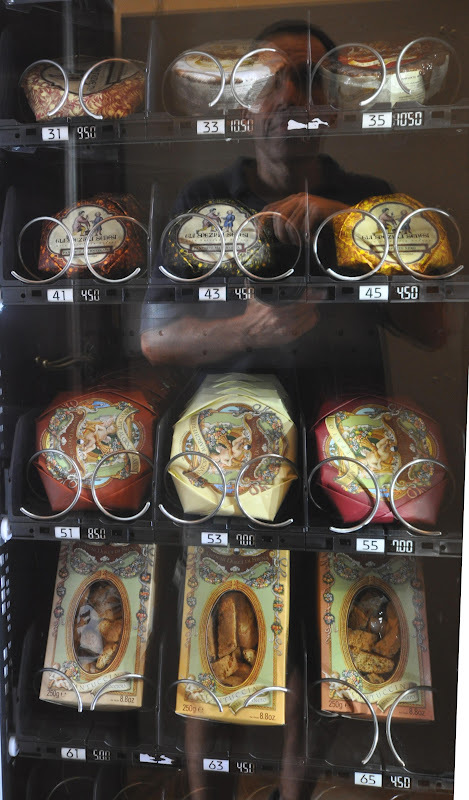 Thank you, Jerry, thank you! 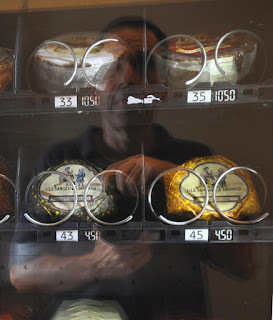 Could you please--as soon as possible--install six vending machines in my home, offering tasty, healthful and timesaving Sienese and Florentine sweets? I am thinking of one each in my living room, kitchen, bedrooms and bathrooms (with perhaps smaller versions in the hallways)?